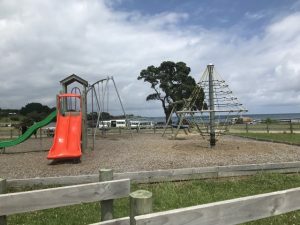 There are lots of bays that are great for swimming in along the Pacific Highway (SH35) east of Opotiki but this particular bay, most commonly known as Schoolhouse Bay has shallow, usually calm water that is great for kids wanting to paddle. The beach area sweeps round giving plenty of room for playing and picnics. Just back from the beach there’s a small playground with swings, a rope roundabout and slides and a little further along there’s also a half basketball court. The Te Kaha store is a few minutes drive away and sells some essentials like ice cream otherwise bring what you need with you. Boats launch off the beach from the area closest to the private camping ground, so you may want to head to the southern end to be away from them. One side of the bay there’s a promontory that you can walk all the way round. 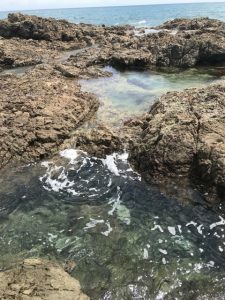 If you’re there at high tide, you might get your feet wet but at low tide, rock pools are exposed and there’s more room for walking. Address: this beach is accessed straight off SH35 with parking near the camping ground and playground.